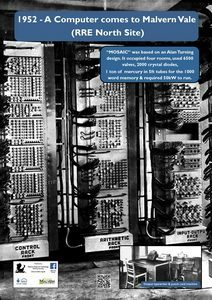 The Automatic Computing Engine (ACE) was an early electronic stored-program computer design produced by Alan Turing at the invitation of John R. Womersley, superintendent of the Mathematics Division of the National Physical Laboratory (NPL). The use of the word Engine was in homage to Charles Babbage and his Difference Engine and Analytical Engine. Turing’s technical design Proposed Electronic Calculator was the product of his theoretical work in 1936 “On Computable Numbers” and his wartime experience at Bletchley Park where the Colossus computers had been successful in breaking German military codes. In his 1936 paper Turing described his idea as a “universal computing machine”, but it is now known as the Universal Turing Machine. 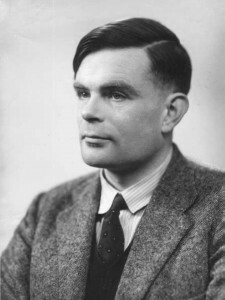 On 19 February 1946 Turing presented a detailed paper to the NPL Executive Committee, giving the first reasonably complete design of a stored-program computer. However, because of the strict and long-lasting secrecy around the Bletchley Park work, he was prohibited (because of the Official Secrets Act) from explaining that he knew that his ideas could be implemented in an electronic device. 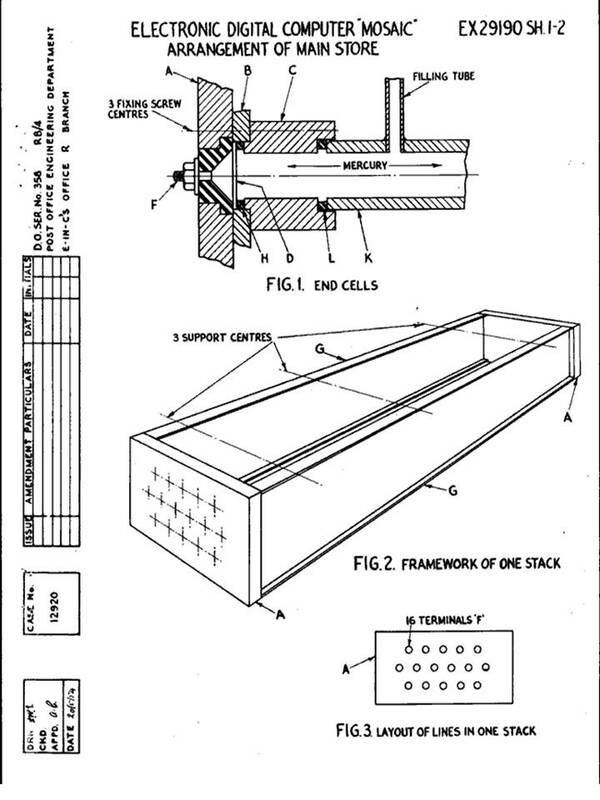 The better-known EDVAC design presented in the First Draft of a Report on the EDVAC (dated June 30, 1945), by John von Neumann, who knew of Turing’s theoretical work, received much publicity, despite its incomplete nature and lack of attribution of the sources of some of the ideas. 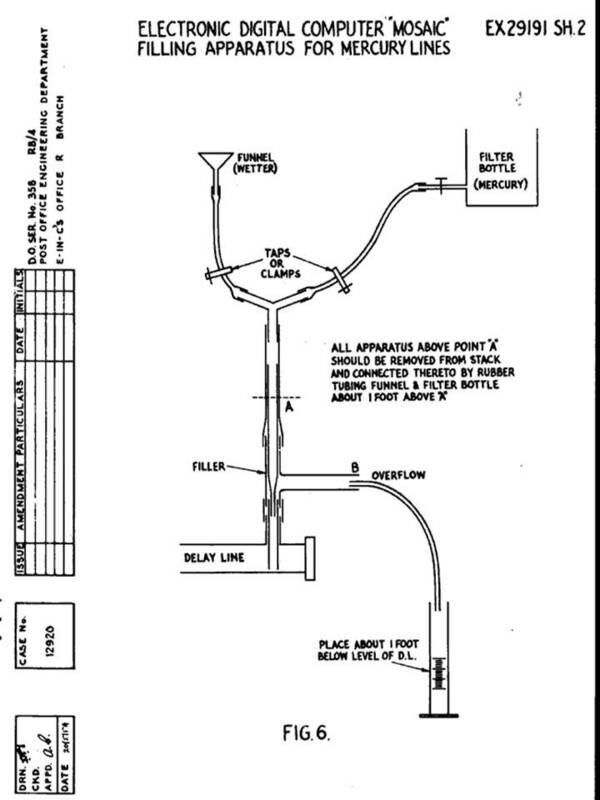 Turing’s report on the ACE was written in late 1945 and included detailed logical circuit diagrams. He felt that speed and size of memory were crucial and he proposed a high-speed memory of what would today be called 25 KB, accessed at a speed of 1 MHz. The ACE implemented subroutine calls, whereas the EDVAC did not, and what also set the ACE apart from the EDVAC was the use of Abbreviated Computer Instructions, an early form of programming language. Turing’s colleagues at the NPL, not knowing about Colossus, thought that the engineering work to build a complete ACE was too ambitious, so the first version of the ACE that was built was the ACE Pilot, a smaller version of Turing’s original design. The Army had for some time had to face the labour intensive task of analysing masses of Kine theodolite data from its several trial ranges and Army’s Radar Research and Development Establishment (RRDE) undertook to investigate the possibility of performing this electronically. This led to the second implementation of the ACE design which was the Ministry of Supply Automatic Integrator and Computer (MOSAIC). This was built by Allen Coombs and William Chandler from Dollis Hill, who had worked with Tommy Flowers on building the ten Colossus computers. 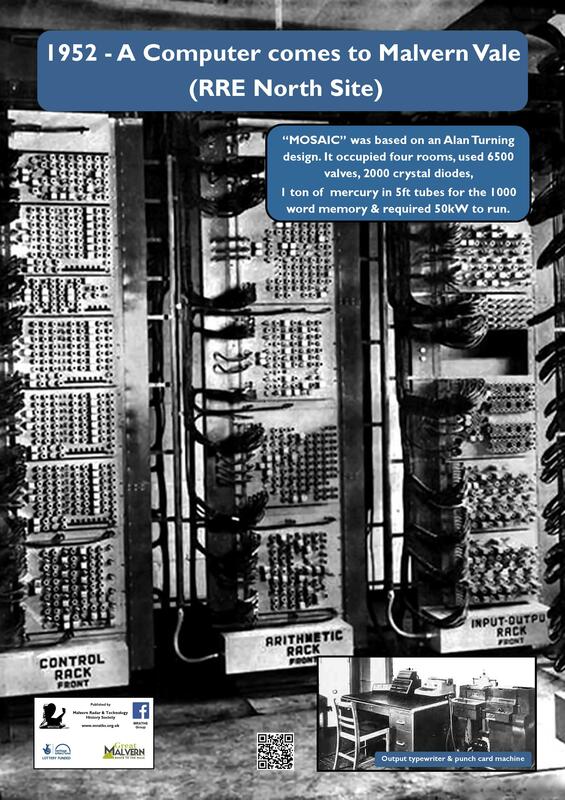 MOSAIC itself contained 6,480 electronic valves and about 2,000 crystal “valves.” The whole computer occupied four rooms, the heart of the machine being the Computer Room containing the electronics. 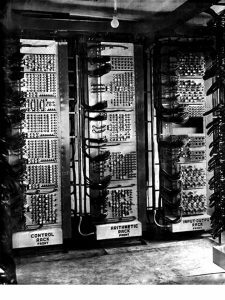 Although not the earliest of the early British computers it was the largest. It was operational until the early 1960s. Here the floor is completely, covered with earthed copper foil to help reduce outside interference. The copper is covered in a thick rubber carpet to give the engineers an even chance of avoiding electrocution. There are twelve 9 foot racks of electronic equipment (consuming 50,000 watts) all of which are forcibly cooled by great blasts of air. The total length of cabling connecting together the 250 separate panel racks is an estimated 5 mile. Next door to the computer is the memory or store of MOSAIC. 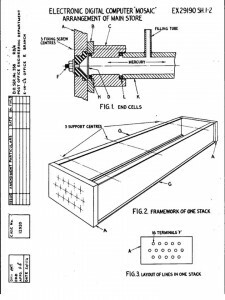 This stores around a 1000 words of 40 digits long, in a large wooden temperature control thermally insulated box containing a hundred long steel delay lines nestling together in their conditioned nursery like a orderly row of orderly babies. 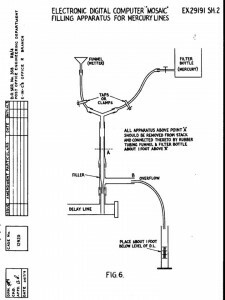 The delay lines are hollow steel tubes filled with mercury. MOSIAC stored its information by converting it into a string of pulses transmitted down the delay line in the form of acoustic vibrations. These are collected at the far end, amplified, reshaped, and re-timed electronically, then sent down the delay lines again. Thus the information circulated continuously (performing the complete cycle 16,000 times every second) until it either deliberately cancelled or MOSIAC is switched off. The successful operation of the delay lines required absolute cleanliness. All parts were swabbed with carbon tetrachloride. The quartz crystals were boiled in concentrated nitric acid for an hour and when cool washed in absolute alcohol and finally washed in carbon tetrachloride. The delay lines were then filled with mercury, five tons in all. 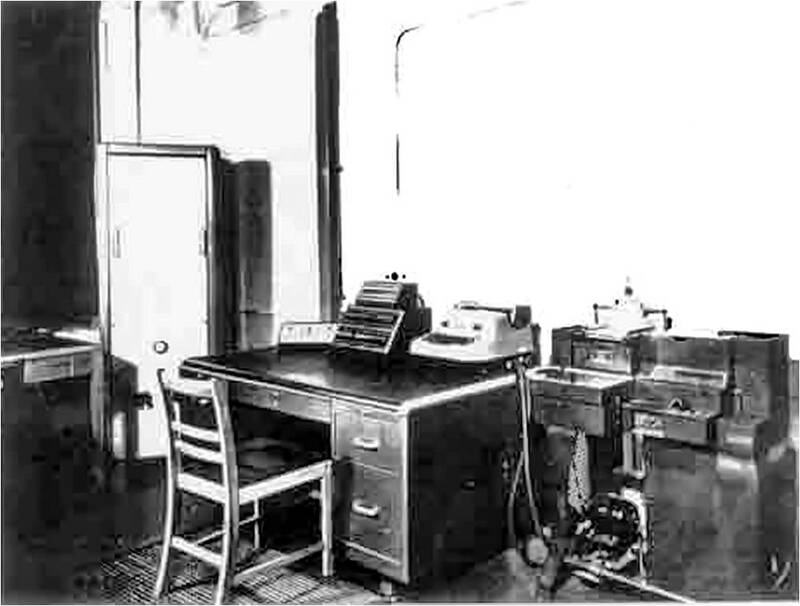 The third room contained equipment for sorting and translating thousands of punch cards used in the operation and a fourth room is the control room. The control room contains all the facilities of feeding data and instructions into MOSAIC and receiving the results of the computation. 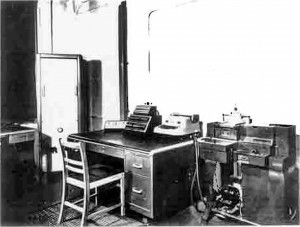 In normal operation all information is fed into the computer by punched cards read in the rate of 200 per minute. Data may also be read in on photographic film or by use of a bank of hand operated keys. The results coming out of the computer may be obtained in several ways, one can arrange for them to be typed directly but although the electric typewriter produces 10 characters per second it is still very slow when compared with the calculation speed of the computer. Results are usually fed to a machine which punches the data onto cards. “No programmer is allowed to use the computer until the engineers are satisfied everything is functioning as it should. To do this the engineers have a testing programme that is run every morning for half an hour for the days computing begins. This program tests all the units and facility very thoroughly. During these early years the average percentage of time for which the machine had been usable for operational computing or program testing had been in the order of 75% over this period. The remaining 25% of the time had been equally divided between preventative maintenance and time during which the machine was definitely unserviceable due to faults. The average rate of valve replacement has been 10 per month. The most serious cause of faults had been the drift in high stability resistors and this has been accentuated by some degree of inadequacy of the cooling and ventilation system. This type of fault was markedly increased during the warm summer of 1955.